I have a Hasbro 2015 Luke Blue Black Series and want to fully customize it. - Sounds prizm v5.5 so I can fully customize and add an improved speaker. - tri-LED (RGB) so i can change to any color at will. I added all these items into my cart and want to make sure I am purchasing all i need and not missing anything (or over buying). Also want to make sure everything fits properly....Rather than doing trial and error. I am excited for this new project. If anyone has their saber photos and list of parts to share for their Luke ANH or REY TFA. Also any wiring diagrams and/or tips for the Prizm. (or if you recommend another board, and why. Prism and the cree you picked out will work well. You only need the Tri-Cree carclo lens, you don't need a holder. The lens secures onto 3 holes in the tri cree. The tri cree secures onto the heat sink with thermal tape that screws into your adapter kit. The MHS V1 Style 6 chassis will hold: your battery, soundboard, speaker, and potentially RC Port. It fits loosely into the MR Luke even when you use T8 Tubing to protect your electronics. I use a set screw to secure it, as you can see in my previous builds; however, that set screw is subdued. Time to learn to drill and tap if you haven't, it comes in handy. The prism will need 2 switches. With some creativity, you can adapt 2 switches in the clamp, but you'll need to be really creative. You will not be able to re-use the latching switch, except for potentially as an external kill switch. I get rid of that one altogether usually. I usually use Graflex 2.5 red button bezels, and adapt them and the conversion kit to be used as one of the activation buttons. On the Luke Conversion, I believe I retrofitted the clamp for activation. Your switch plans will need to be solid if you want full prism functionality like color changing. You will need 2 switches. If you don't want to mess with 2 switches, you can still achieve 3 different colors on Nanobiscotte IV with a power extender module. That wiring is a bit more complex, and then you have to program in your color desires into each bank, but it can be fairly easily achieved via the instruction manual. I haven't realized you replied to my question. Never received an email even if I was subscribed. I have a couple questions and an updated list below. I am starting to understand much much better. 1) The removable battery, how is it charged when you remove from saber? 2) Can i use my hasbro blade? or do i have to purchase a new one? whiuch you recommend? its 1.0" I assume. 4) what is a carclo? i cant find in the store. 6) I want to make it look like as authentic as possible. Thinking of doing your install putting a micro switch under the card with beer can wedges. How ingeniuous! Which switch you use? and do you have a clearer photo of the install? 7) As an alternate, later i may go the activation box 1 method, but am trying to understand if it fits perfect into the existing holes or i have to drill (which i prefer not to do.). any advice? 8.) Oh also noticed there is a NANO V4 pre-wired. Will it fit inside the style 6 chassis with the Power Extender (which is currently out of stock). So excited and your videos are fantastic! Almost ready for my purchase! I am a wire harness engineer for 20 years working and love working on projects, so excited for this one. ****How do i charge battery? Last edited by inazuma; 04-10-2019 at 10:12 AM. 1) The removable battery, how is it charged when you remove from saber? You charge it on an external charger. You have to buy one separately, most stores have them. 18650 charger. 2) Can i use my hasbro blade? or do i have to purchase a new one? whiuch you recommend? its 1.0" I assume. Better to not reuse the Hasbro blade. Its like 3/4". The conversion kit is 1" ID. 1" blade is what you need. 3) Is the Prism or the Nano V4 the best board? I want to go all out. most features and best sounding. Prism, is what I'd go for, but then you need 2 buttons to use all the features. 5) Is the speaker i chose correct? 2W 28mm Bass Speaker (I saw the work VECO in one of your lists and dont know what VECO is) Yes, Veco bass speaker is the 2W 28mm speaker. That is the right one. 6) I want to make it look like as authentic as possible. Thinking of doing your install putting a micro switch under the card with beer can wedges. How ingeniuous! Which switch you use? and do you have a clearer photo of the install? I can send you some of those switches, I have hundreds of them. 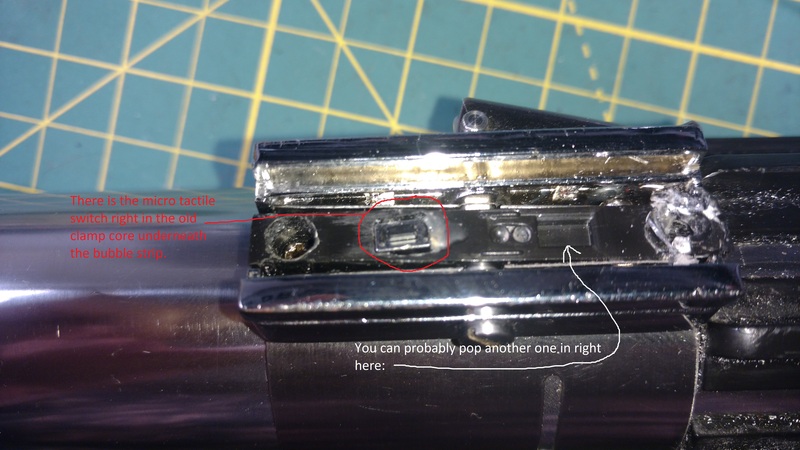 You have to dremel out a hole for them to sit in in the plastic clamp piece. Very carefully and slowly. PM me your address, and I'll send you 4 of them. 7) As an alternate, later i may go the activation box 1 method, but am trying to understand if it fits perfect into the existing holes or i have to drill (which i prefer not to do.). any advice? You would have to modify to use TCSS' activation box. 8.) Oh also noticed there is a NANO V4 pre-wired. Will it fit inside the style 6 chassis with the Power Extender (which is currently out of stock). They sell that Nano prewired in a chassis I believe. Kill Plug Style 6 (alternate plug) You don't need kill keys on the MHS V6 chassis, unless you cut in a recharge port into it. Perfect thank you. I put in my order minus the blade last night. I do have a dremel, thank you. Thinking of putting maybe 2 switches in similiar like you. That carlco lens is inside my order as well. I ended up ordering the bare nano, wish I waited since you said the Prizm is better. Maybe i will upgrade to prism later. I will look for a charger, never heard of these before. as far as the blade, i will get a 1.0" blade. what is common to show all colors? Clear or White? The clear we will need a difuser i assume. The white does not? which is best color and brightest? I dont plan on dueling with it so is thinner better?? Also tips. pointed or round? Cant wait to get my order and will put an order for my blades as soon as you answer back thank you ! - May the FORCE be with you, always. I don't work for TCSS, I'm just a schmo like you. I'll drop those switches in an envelope to you. As for blades, for in-hilt builds, I like clear blades with clear cellophane wraps inside. There are lots of tutorials about building in-hilt blades. Its really relatively easy. I'm now partial to round tips, but for neopixel blades I like the parabolic. I don't have any better pictures of the switches installed; however, I'm currently converting an Anakin ROTS Graflex with the same type of setup. I'll see if I can get some better pictures of the switch in the clamp. that photo is perfect i can see it now. and thank you for the information. you have been ever so helpful. oh and thank you for the switches!! !